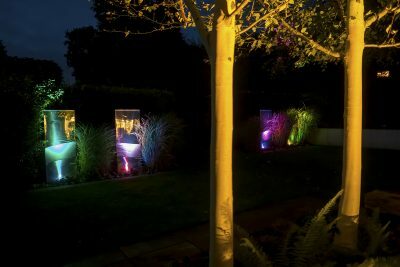 The Night Time Garden:- garden lighting. As we enter the deep days of winter and darkness fills large quantities of the day, we tend to retreat inside and the garden can disappear into the gloom and deepening dusk. 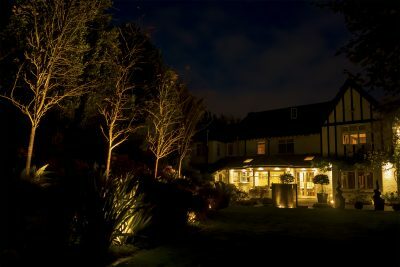 But this extra length of darkness can bring a new dimension to your garden, this is when garden lighting comes into it’s own. There is of course always the practical, not nose diving down a set of steps, or turning out of the garage in a dark damp December afternoon to walk into the shrubbery and miss the turning onto the garden path. Most people instinctively at this point reach for the blast of the hydrogen security lights which of course do the job, but this is, as unsubtle as a punch on the nose. There are more elegant solutions which do the job just as well. For steps, a strip of LED lights, running under the edge of a riser, pick out each one beautifully and a coloured strip, like deep purple or aqua-marine turn a practical use into a feature in it’s own right. 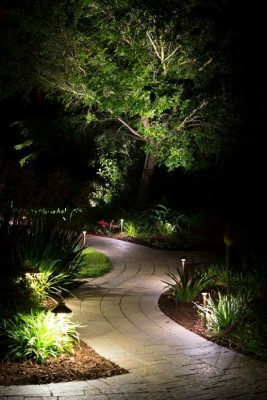 The course of a path and it’s change of direction can be picked out, by low energy lights set into the edge of the paving, lighting your way as you move through the garden, turning the practical need to get from the garage to the back door, into a sinus line of light spots meandering through the darkened garden. Of course winter can bring out the very best in up lighting mature deciduous trees, the dappled effected of up-lighting a tree in summer, as the light changes on the leaves and their movement is of course beautiful in it’s own right, but in winter it moves from mealy beautiful to stunning. The light plays and picks out the textures of a mature trees bark, it traces the many main branches as they subdivide into ever small branches right down to the delicate tracery of the tiny twigs at the out edges of a trees crown. It’s whole breathtaking habit and structure shown in all it’s beauty. I defie anyone not to be struck by the ‘wow’ factor of a large tree well up lit. This can make a tree which for most of the year may be mealy the back drop of the garden, into the night time garden’s star focal point. A feature like this for most garden owners can be enjoyed from the comfort of the sitting room arm chair as they gaze out into their winter dark garden. Moon lighting shining onto the terrace below. 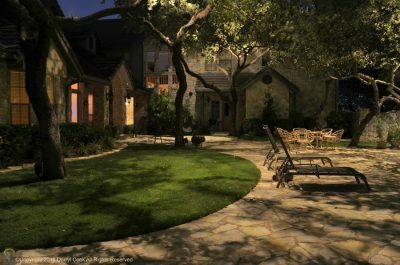 For many the concept of garden lighting is all about outdoor entertaining, turning sunset cocktails into long barbecue party nights. Again, most people have their patio or large terrace, next to the house, and think again either about the security lights or about the powerful wall lights most people have by the front door or next to the shed door. Again of course they do the job, but there are more imaginative approaches. First of all if you are having a party it is pretty unlikely you are all standing in the garden next to the house with all the house lights off, of course a certain amount of the back ground garden lighting is going to come from the house. Then have a look and see what you have growing near the patio if you are lucky enough to have a tree and it is mature and tall enough, then you can produce a gentle and subtle lighting effect. 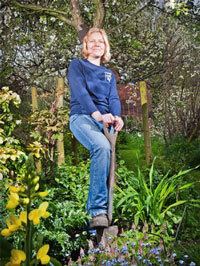 Hanging specialist ‘moon lighting’ in the branches of a tree, will create pools of light on you patio. Not only will it light your party giving it a gentle wine bar ambiance it will also create intriguing shadows from the tracery of the tree branches onto the paving below. Also low level up-lights through the planting and angled across the terrace at knee height will light a terrace well. The outer edges of the patio, where it edges, planting beds or where a path or steps lead off can be marked with ‘Candle lighting’ these are thin elegant lights, set at below knee high that like the name suggests give out a small glow of light, just enough to mark the edges and guide you at night. 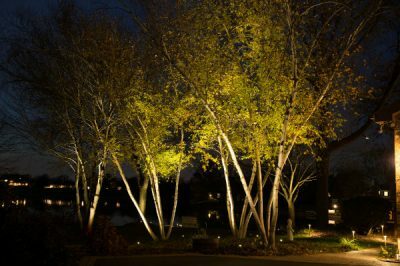 One of the main reasons for having garden lighting is to light ‘features’ whether this is a tree or an architectural plant like a group of Agaves or similar. A garden sculpture, or a pergola or fountain. These undoubtedly become the stars of the night time garden. Up lights can be used to subtly use light and shadow to pick out the features in a face or form. The movement of water can be seen on a fountain or the surface of a pool with submersible lighting. 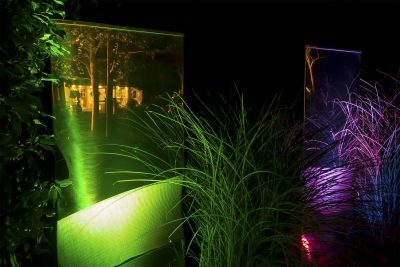 Or you can hit the disco and go for some wacky lights that are coloured or change colour gently scrolling through a coloured rainbow. To add that extra night time ‘wow’ factor! I must at this point add a note of caution, when it comes to garden lighting less really is more, I am sure you have all seen the very well intentioned lighting over kill. 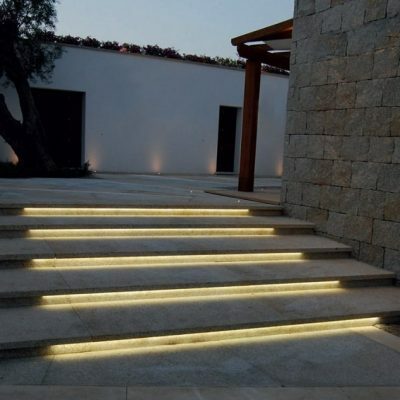 With steps having 2 lights per step, paths that seem to have a light every half meter. Or the ‘I like it all’ garden lighting mentality, where your eyes bounce from lights all round the patio, to every rather uninteresting blobby bush being picked out. To an argument of different coloured lights round the garden. Turing the whole garden into a light polluting mass, that is to distracting to look at and no doubt cost a fortune to put in and to run. It is possible to have too many lights! Good lighting design is about knowing what to light and when to stop, for it to work well it needs the darkness of the rest of the garden to high light your well lit feature, it might be just one beautiful tree, or the practicality of getting you to the garage, in a way that has turned into a light feature on it’s own. The good thing about modern lighting is there is a lot on the market and they now use very low voltage and are therefore pretty cheap to run. 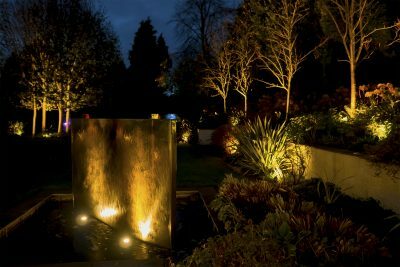 Also there are some very good lighting designers and electricians that specialise in the installation of garden lighting. I would always recommend a specialist is used in this field, it needs very particular knowledge and is not like wiring your kitchen. So I urge restraint when deciding on the lighting in you garden. Enjoy your night time garden! 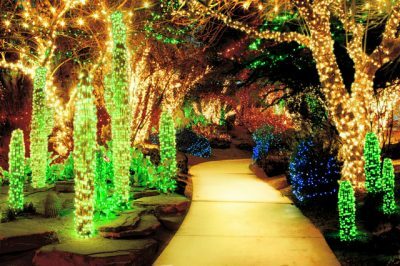 This entry was posted in Gardening Thoughts, Gardening Tips and tagged garden lighting on November 30, 2017 by Emily.